Like many of you, my first tastes of many obscure vegetables came from my garden. This is certainly true of the edible chicories, which are embarrassingly easy to grow. I first encountered chicories in a mesclun mixture, and have since begun growing endive, escarole, and radicchio on their own. In addition to growing edible chicory greens, you can force dormant chicory roots to produce pale sprouts, as Jeremy described in Grow in the Dark: Crops That Don't Need Light. Growing chicons is still on my "upcoming gardening adventures" list, but already my garden is full of chicories. As you might expect with a plant native to the Nile River Valley that’s been in cultivation for more than 5,000 years, edible chicories exist in several very different forms. Endive (Cichorium endivia var. crispum) is included in many mesclun mixtures, or you can buy seeds by the packet. 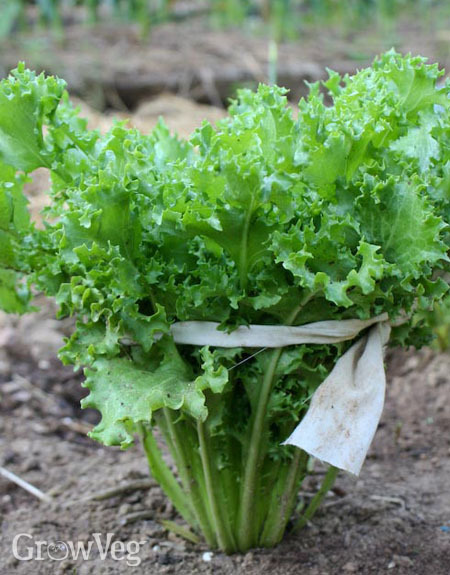 Sturdy endive seedlings are easy to lift and move, and by early summer they grow into tight rosettes of frilly, finely cut leaves. The innermost of them are often called frisee when added to salad mixtures. Like mustard greens, endive has a bitter bite that is easily tamed by cooking. Endive braised in olive oil with many slivers of fresh garlic makes a supremely satisfying side dish, with or without its traditional anchovy accent. Escarole (Cichorium endivia var. latifolia) is sometimes called broad-leafed endive, but I think of it as a different vegetable. Slow-growing yet heat tolerant, escarole’s leaves are structured by a thick rib that helps them hold their shape when chopped and braised, or added to white bean soup. I love to find escarole seedlings in mesclun mixtures, because escarole is always happy to be the last man standing after all the lettuces have been picked. With escarole, I go to the trouble of blanching the plants for a week or so by tying a piece of soft cloth around them when they’re almost fully grown. Depriving the inner leaves of light this way keeps them pale in colour, stiff in texture, and mild in flavour – just what you want in a gourmet garden green. Radicchio (Cichorium intybus) produces beautiful red heads that look like they might be difficult to grow, but radicchio is no more challenging than lettuce in a home garden. Depending on variety, radicchio can grow into round heads or elongated ones. Both can provide the crunch of cabbage with a bitter bite when eaten raw, or you can grill or sauté your radicchio for a more gentle flavour. Insects ignore radicchio, so it’s often easier to grow a head of radicchio than a head of cabbage. Belgian endive (Cichorium intybus), also called French endive or witloof chicory, is grown during the summer, and the thick roots are dug in late fall and stored until midwinter. Soon after the chilled roots are replanted, they produce a succulent bud that can be kept white to pale green if protected from light. Cultivated varieties will produce big buds, called chicons, but if wild chicory grows near you, you can try harvesting and forcing wild-gathered roots. The starry blue flowers seen on roadsides in midsummer are often wild chicory. Forage chicories (Cichorium intybus) produce an abundance of greens that are palatable to chickens, and may help prevent certain intestinal worms when eaten regularly by sheep, cows, horses and other ruminants (grass-eaters). The varieties farmers use in diversified pastures may be hard to find, but you can substitute Italian dandelion chicory, also called Catalogna chicory, if you want to grow a perpetual supply of healthful greens for your animals. Please note: I suspect that cultivated radicchio contains the same parasite-purging properties as more primitive chicory forms, because in autumn the deer seek out my plants at eat them down to the nub if I don’t keep them covered. The deer are wiser than we think! In one study, grazing on chicory greens reduced two types of common parasites in young deer. My style of grazing veers toward brightly flavoured braised endive, escarole soup and grilled radicchio, and I suspect that the health benefits of eating these chicories go beyond their respectable levels of vitamins A, C, K and folate. When eating chicories raw, you can play off of their sharp taste by bringing in the sweetness of fruits, for example adding mandarin oranges to an Asian-style slaw made with radicchio, or pairing endive with grapes, apples or pears. Similarly, braised endive achieves a smooth finish if you use a sweet and mellow balsamic vinegar for deglazing the pan. Should you find yourself in a sinful mood, a gratin of escarole made with guyere cheese must be tasted to be believed. It’s that good, perhaps in part because it comes from the garden. "I have not had a lot of luck with radicchio. I either plant it too early, or too late. "Indigo" is supposedly a fool-proof cultivar, but I've yet to get one with a tight head. Perhaps you could offer some growing advice- outdoor sow, or transplant, partial shade or full sun, fall or spring? Cultivar recommendations. I'm pulling my hair out over this one!" "April, I think radicchio needs a head start in spring indoors. I set out the seedlings between rows of onions. It is easy to grow in the fall, so try it again, even if you must start seeds indoors because of heat. With leafy greens I have good luck setting out indoor-grown seedlings under shade covers in late summer. Good luck!" "Last year I had beautiful radicchio. I planted seedlings at the end of May, here in Canada, Ontario, at the shores of Georgian Bay. (climate 5). The best was grilled with EVVO. This year I keep my finger crossed. The month May was rainy and cold, today at the beginning of June we have 36C and black flies." "like most areas, we've had no rain in the charente since April - can I use grey water ? " "Grey water shouldn't be used on salad crops, although if you are careful and only apply it early on directly into the surrounding soil it could be OK. There's more information here: http://www.growveg.com/growblogpost.aspx?id=144"